Who loves ginger as much as I do? 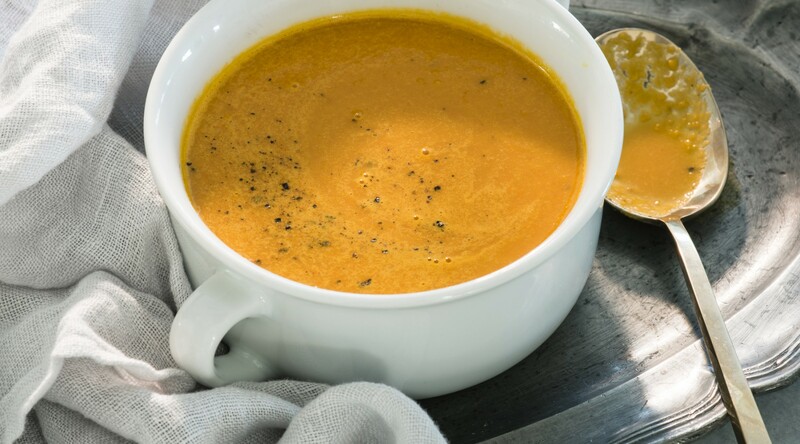 With ginger powerful anti-inflammatory properties and a delicious bite this soup is sure to be a family favorite. This nourishing soup packed with beta carotene comes together in less than 40 minutes. Enjoy a warm bowl with your favorite movie on and a cozy blanket. Cut the zucchini and carrots into bite-sized pieces. Add cut zucchini and carrots to a steamer, steam for about 7 minutes. Heat a large non-stick saucepan over medium heat. Dry-sauté method: Once the pan is hot add 1 tbsp water, chopped onions, minced garlic, sliced leeks, salt, and pepper and sauté for 4-5 minutes. Add water as needed and keep moving onion mixture around pan so they don't burn. Once onion mixture is slightly tender and golden brown, add the steamed zucchini and carrots. Stir for additional 1-2 minutes then remove from heat. Add water, coconut cream, avocado, nutritional yeast, cumin, lemon, and sautéed carrot mixture to blender. Combine all the ingredients and purée until smooth. Adjust the salt and pepper if needed. Let it chill before serving to allow the flavors to fully meld. Top with chopped chives and toasted pepitas.